Data loss can affect the best of phones. even the Galaxy phones that have set the market alight in terms of quality and sale, are not immune to the curse of data-loss. We can cover our Samsung Galaxy gadgets by the priciest screen and phone covers, but there’s no sure-shot protection against moisture. And even if we could guard against moisture, we could still encounter erroneous updates and virus-attacks that can cause data loss in your devices. Just like your income tax, data loss will keep eating away at your peace of mind. While Samsung Galaxy Data recovery options abound, not many can hold a candle to dr.fone - Recover (Android). 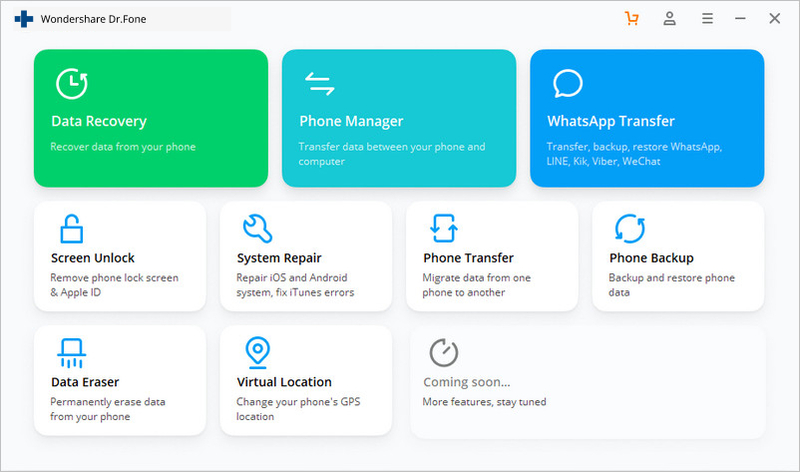 With the highest recovery rate in the industry, dr.fone can retrieve deleted files from Samsung Galaxy phones due to human errors, software bugs and hardware glitches. As mentioned before, dr.fone is like that amulet with reanimation magic that could provide a constant protection against the unrelenting evil of data-loss. It can reanimate and retrieve deleted texts, contacts, call logs, photos, videos, etc from your Samsung Galaxy devices. Below, we will find the various guises which this evil of data-loss can assume. And later we will see this magical amulet at work. All of us have accidentally deleted data or dropped our phone. It’s really common way to lose data. See how to perform sd card recovery for Android without hassle here. Virus attacks, although it’s uncommon, happen. More often, a software update or a rooting error can delete your data on your Samsung Galaxy device. When update fails during the installation, your phone malfunctions and goes to recovery mode where data could be lost. Misuse of certain apps can cause a data loss as well. Other causes include Moisture Damage and Power Spikes. These are out of our control and basically can affect anyone. If we had to pick one, we would certainly go for dr.fone - Recover (Android), the world’s first data recovery software that has the highest recovery rate in the Android data-retrieval business. It can recover data from a lot of scenarios like system crash, R.O.M flashing, backup synchronizing error and others. It can retrieve files from Android internal storage too. 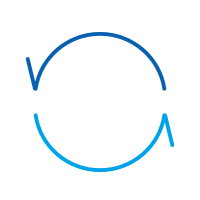 On top of that it works for both rooted and unrooted devices. After extraction, the rooted state of the devices doesn’t change. The recovery process is simple and one doesn’t really need to be a computer-wiz to use it. It suports to recover deleted videos on Android, as well as contacts, text-messages, photos and WhatsApp messages and documents. Step 1. Start dr.fone and select Recover. Now, connect your Android device to the computer with a USB cable. Step 2. 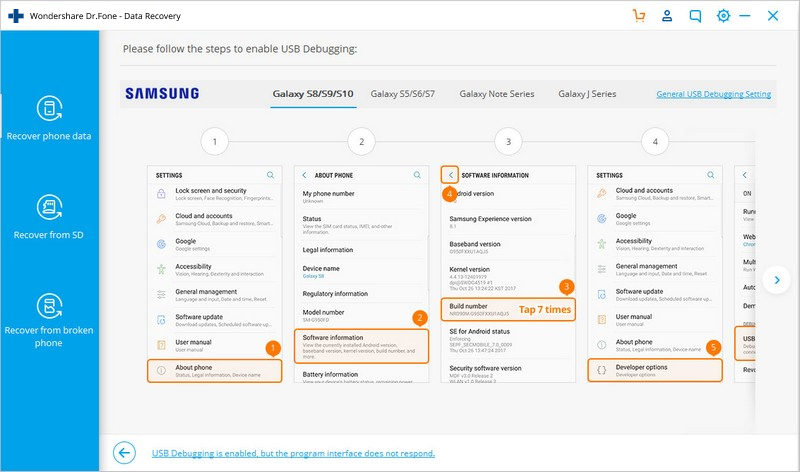 The USB debugging is then to be activated, just allow USB debugging on your phone according to the instructions in the below window. In case you have Android OS version is 4.2.2 or above, you will get a pop-up message. Tap OK. This will allow USB debugging. Step 3. 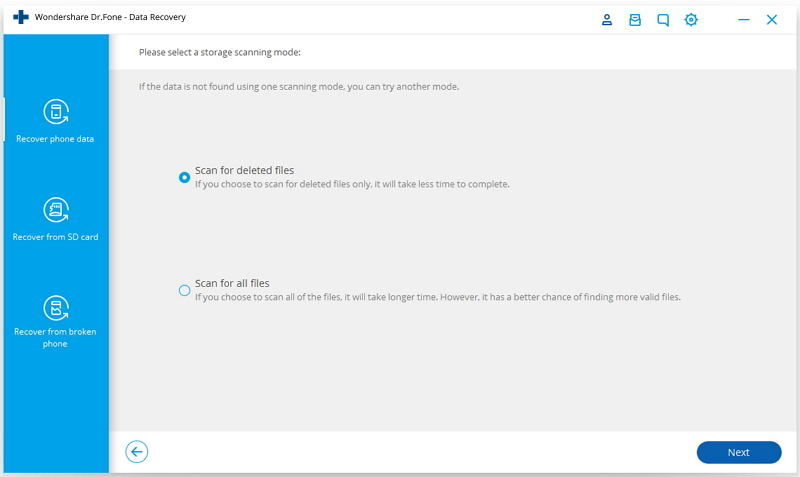 Select the types of file you want to scan for and click ‘Next’ for the subsequent step in the data-recovery process. Step 4. Select scan mode. dr.fone offers two mode: Standard and Advanced. Standard Mode is faster and we recommend you to select it. However, if Standard doesn’t locate your deleted file go for Advanced. Step 5. 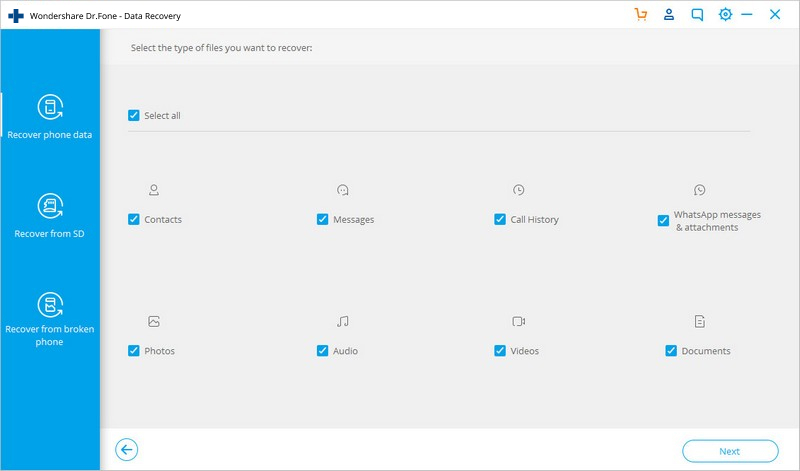 Preview and recover deleted files. Then select the files you wish to undelete and click ‘Recover’. Apart from retrieving files from memory card and internal memory, you can also preview files before recovery. Also, recovery is guaranteed without overwriting any existing data. You can always make use of its free 30-day trial to explore all of its android data-recovery features. Learn how to retrieve deleted WhatsApp messages on Samsung S7 in this tutorial. We have come up with two different ways to recover your WhatsApp data. Learn how to perform Galaxy S5 broken screen data recovery in two different ways. We have provided in-depth solutions for data recovery Samsung Galaxy S6. Why can deleted data on Samsung tablet be recovered? This guide tells you why and how you can recover contacts, SMS, photos & video from Samsung tablet. 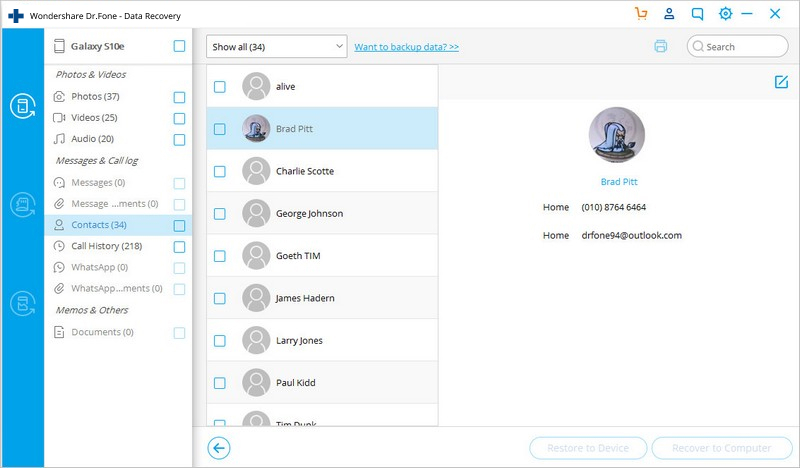 Here’s presenting out the Top 5 alternatives for Samsung Link. The key features for all the alternative apps are shown for you. Do you sometimes want to know exactly what is going on in your phone? Just like Task Manager.